The Junior and Senior High Bilingual Course (also referred to as the Bilingual Program) is the integration of the Japanese national curriculum and the International Baccalaureate Programmes. The school is accredited by the Shizuoka Board of Education and all of the courses offered at Gyoshu including the Bilingual Course follow the guidelines of the Japanese Ministry of Education, Culture, Sports, Science and Technology (MEXT). 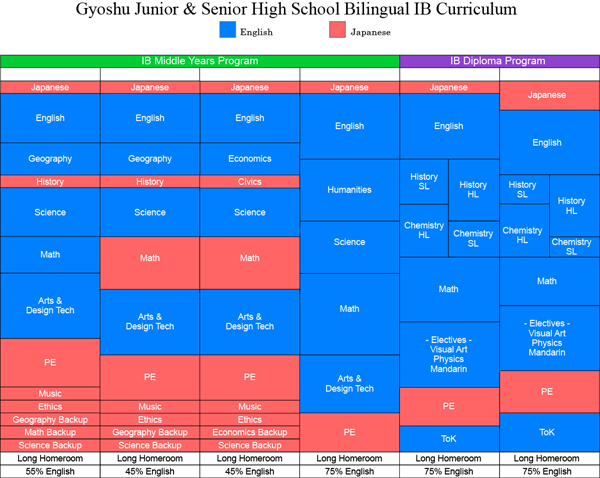 Students learn the same curriculum content as other Gyoshu high school courses as well as other high schools. In this way, the Bilingual Course is similar to the other course options at Gyoshu. However, the Bilingual Course goes beyond these basic guidelines and has integrated the unique and rigorous programs of the International Baccalaureate which are the Middle Years Programme (MYP) and Diploma Programme (DP). 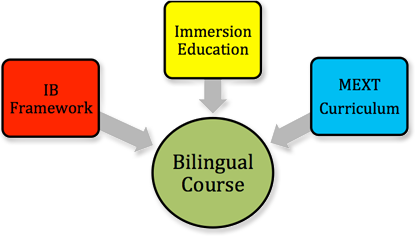 The Bilingual Course conducts 45% to 75% of the instruction in English. The Middle Years Programme is a four year course for students in grades 7-10. The Diploma Programme is for students in grades 11 – 12. The “Bilingual Course” is a six-year program that integrates the MYP, DP, and the National Japanese curriculum into one program and uses two languages (Japanese and English) as the medium of instruction. Katoh Gakuen Gyoshu Junior High School Bilingual Course conducts 45% to 75% of the instruction in English and integrates three important educational elements: MEXT, IB and Immersion Education. (MEXT) The core content of the program follows the curriculum guidelines of the Japanese Ministry of Education, Culture, Sports, Science and Technology (MEXT). (IB) This content is taught within the framework of the International Baccalaureate (IB) Middle Years Programme (MYP) and Diploma Program (DP) using the instructional approach and assessment procedures from the IB. (Immersion Education) As most of the students are learning this content through their second language, we use language immersion pedagogy to ensure mastery of the content and promote high levels of language development.